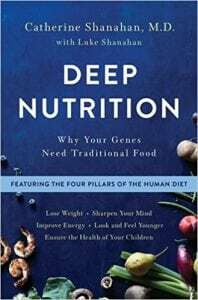 Deep Nutrition by Catherine Shanahan is a book on nutrition that goes deep to uncover a lot of uncomfortable truths about our current status of health. The healthcare system pushes drugs and pills when the solution would simply be better nutrition. Catherine Shanahan says that our generation is not as healthy as our parents or our grandparents. She says it’s because our food has changed. Back then they ate more natural food and didn’t have all the bad processed foods we consume in large quantities today. Very few people learn about nutrition and, surprisingly, that doesn’t include doctors. Shanahan says that medical school don’t teach much about nutrition in schools. And even more worrying, they don’t teach about the causes of the different ailments but only train students to treat illnesses “as they arise” (ie. : look at the symptoms, not at prevention). Catherine Shanahan echoes what Campbell also says (The China Study and Whole) about the sorry status of our Western healthcare system. She says that big pharma companies push on giving medicine and drugs even when there is little need for them or when the fix is simply in switching to a different or healthier diet. Cancer and heart diseases are extremely widespread in our societies. But while they reach epidemic levels among certain groups, they are rarely present in some others that adhere to more traditional cultures. Catherine Shanahan explains that sugar is more addictive and dangerous than cocaine. Our brain indeed has sugar receptors which were developed during a time when refined sugar was not accessible to humans: they are not designed to handle today’s sugar overload. Indeed they get easily swamped and more sugar is necessary to give us the high that we crave. Which is exactly the addiction’s cycle of drugs. During the craze of low-fat products of the last decades (also read Eat Fat Get Thin and The Big Fat Surprise) guess what did manufacturers add to make up for the loss of fats? And to muddle the water, new different names came up: malt, maltodextrin, sucanat, corn syrup and fructose. Different names, all bad derivatives of dangerous sugar. Cooking meat on the bone releases glycosaminoglycans and minerals which are good for you. Sprouted food are seeds or legumes that are left in water for a few days until they germinate. To nourish the sprout the seed releases enzymes that converts the starch intro nutrients. If you were avoiding bread because of the wheat, feel free to consume sprouted one! Alternatively, beer, wine, cheese and yogurt are also all fermented food. Some fresh and uncooked vegetables, the fourth pillar, is rich in antioxidants. Some of them include pepper, broccoli, garlic and celery. There are exceptions though, for example carrots which release their antioxidants when heated. That was a very good suggestion and something new I learned thanks to Deep Nutrition. Another great takeaway. It’s difficult to apply as I don’t think I’d be able to find it, but it’s worth keeping in mind. Pregnancy is not easy on the body. Take your time to recover between children. At times it feels to me like the author is generalizing what she has seen in her practice to the global population. That’s induction fallacy and of course the sample size is self-selected among the non-healthy ones. However the point she makes is still valid. Most sprouted bread you’ll find will come in envolopes, which to me says “industrial”. I’m not sure you’ll be better off unless you can find a rare local bakery actually doing it. Also many other sources disagree with the tofu recommendation. Deep Nutrition is not a superficial book on what to eat and what to avoid and does not push any agenda. It’s as the name suggests: deep and well researched.